When you are trying to book a flight wouldn’t it be nice if you didn’t have to go back and do a search everyday to check the movement of prices? May be you are trying to book a train and you end up trying between 8 am and 12 noon when IRCTC services are not available. How would it be if you were then informed when the services are available once again, without you having to check back in the app? Now all that is possible on your Android phone with the Cleartrip app. We have built in support for Now cards from Google so the information is only a tap away. Simply tap on the Google app icon in your Android phone and Now cards will offer you information on the fares of the most recent flight search you did with Cleartrip or when you can book that train ticket. 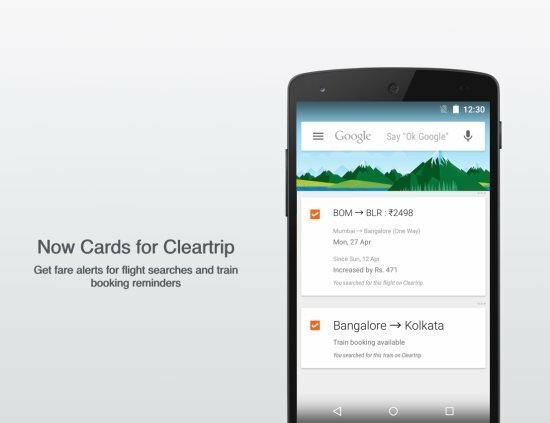 All you need to do is enable Now cards from Cleartrip from your Google app settings. Do try out Cleartrip’s integration with Now cards and let us know what you think of the experience. We would also like to hear about what else you would want us to support via Now cards. Please note this will be rolled out in a staged manner. So the cards will not be available to all users right away.